Southern Seminary President R. Albert Mohler Jr. and Southeastern Seminary President Danny Akin discuss "The Urgency of Evangelism" in a panel held during Southern's Great Commission Focus. 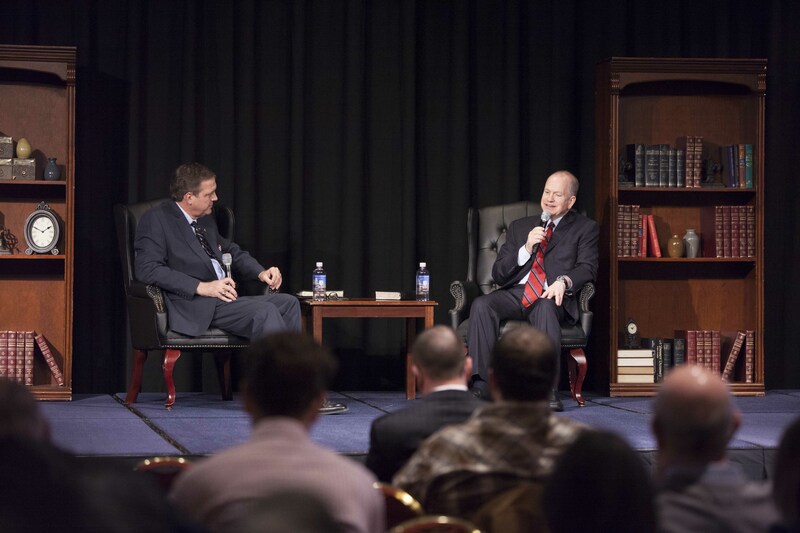 An increasingly secularized American culture sees evangelism based on the exclusivity of the gospel as a threat, said two Southern Baptist seminary presidents in a Feb. 10 panel discussion at The Southern Baptist Theological Seminary. The school hosted the panel with President R. Albert Mohler Jr. and Danny Akin, president of Southeastern Baptist Theological Seminary, as part of Southern’s Great Commission Focus. “In the eyes of many, a belief in the particularity of the gospel is a threat to world peace,” said Mohler. Mohler specifically referenced the recent National Prayer Breakfast, where President Obama said religions that claim to be the only way to God are dangerous. Mohler mentioned that William Saletan, agreeing with Obama, wrote on Slate.com that Islamic terrorists and exclusivist evangelicals were in the same category. In this changing culture, Mohler noted two questions that he previously found useful in starting gospel conversations. He learned from Evangelism Explosion, a ministry that teaches people to share the gospel, and asked their questions: “Do you know for sure that you are going to be with God in heaven?” and “If God were to ask you, ‘Why should I let you into my heaven?’ what would you say?” However, those questions no longer work, he said, because people no longer fear hell. Now Mohler asks, “What are you living for?” and “How is that working for you?” People usually answer these, while often rejecting someone who tries to talk directly about spiritual things. Akin, former dean of the School of Theology and vice president of academic administration at Southern, said the gospel has always been scandalous but “in this day and age, it’s becoming a hostile scandal.” He said Christians should expect opposition, not only on gender issues but also to the gospel itself, but they must not let fear of rejection stop their evangelism. After all, Christians are not ultimately the ones being rejected. The presidents also discussed how much people must understand about Christ to be saved. Akin said someone must understand that Jesus lived a sinless life, died in our place, and rose from the dead, and Mohler said someone must also grasp the divinity and lordship of Christ. Though Christ is the heart of the message, both speakers said that failure to understand sin is what prevents most people in this culture from believing the gospel. “If sins are the problem, then moralism is the answer. If sin is the problem, then only Christ is the answer,” said Mohler, who said he knew about Jesus growing up but did not feel the weight of his sin until he was 10 years old. He realized then that he did not just commit sins but that he was a sinner. Akin and Mohler said that Christians must consider the context of the person they are evangelizing and remember that the gospel is counterintuitive. As Romans 10 says, people must hear it before they can respond. Mohler said that learning a basic outline of the gospel helped him not forget any of the components. Akin recalled a man teaching him to use the Romans Road, a method of explaining the gospel using only verses from the book of Romans. Mohler learned how to start a conversation and steer it to the gospel by witnessing with a partner. Finally, Mohler and Akin encouraged attendees to evangelize without fear because it is the Christian’s responsibility to be faithful and it is God’s responsibility to save. “It’s the Word of God that he blesses, not our presentation of it,” said Akin. Southern Seminary’s annual Great Commission Focus is a week-long event promoting missions and evangelism and sending students to share the gospel in the city of Louisville.